Turbo Blankets!!!! - Miata Turbo Forum - Boost cars, acquire cats. Ok guys, I had talked about trying to set something up so we could get some of these nice turbo blankets for around $110 shipped. I got it all set up with Alamo and called and ordered 2 already. They are available in black and silver. You can call them at 817-860-4300 and reference the "Kelly Deal" for the turbo blankets. Here is a pic of mine. Last edited by Kelly; 08-02-2007 at 01:46 AM. They fit T3 and T4 based turbine housings no problem but they will also work on a lot of the smaller stuff as well when you cinch them up. You can see in my pics it fits well on my old T3 with room to cinch it up even more. Did you find out the dimensions or should we ask when we call? Shoot them a call and see what they say. I think it will snuggle down on your T25 no problem though. This is no group buy or anything. I needed a blanket and so did a buddy so I figured I would make a call to see if a bunch of people wanted them if we could get a small price break. Exactly how well does this thing work? I understand it will lower underhood temps, but by how much? Does it improve with scavenging? Are there ANY drawbacks? you'll be able to rest your hand on top of the blanket. All the heat stays in the housing, which likely results in improved turbine efficiency. Lower underhood temps are good for lower final intake temps at the manifold if the sourced air isn't as warm. 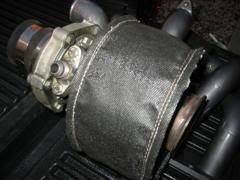 No need for being super creative with metalwork and making heat shields. Brain pretty much summed it up. They do a great job keeping the heat in. That's what I thougt... maybe after Christmas. Car money this month goes to dyno. Any issues regarding trapping moisture against the turbo? It's not acting like a sealed header wrap, so I would assume no worries. After taking a second look at my turbo I just don't see how I would mount this thing. 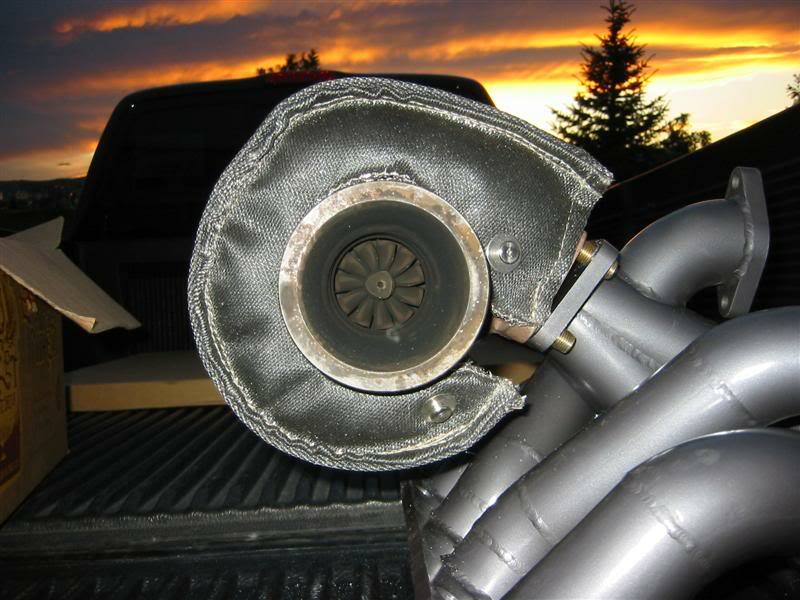 The WG hookup and large dp flange would make my install comletely different than what you have pictured on your turbo. Ugh! I'll send mine to someone if they wanna test fit. I don't think it would fit on the Greddy turbo because of the location of the wastegate actuator, might have to modify it some what. send it to me with the vaculator. i can test it on my t3 and brads greddy and take pics. Which will in turn probably convince me to buy one. Ok. It will probably be next tuesday when it ships out unless my blanky shows up sooner.